My last post focused on the pipes of "pipe and drape" booths. This post will focus on drapes. Something you may not know about craft shows is that vendors should have booths that comply with local fire regulations. Any fabric used for drapes should be either flame-proofed or fire-resistant. You can either use drapes that are inherently fire retardant or buy fabric and treat it yourself. Not all show promoters will tell you what's necessary for their particular show and requirements can vary from venue to venue. I've heard stories where fire marshals have come to shows, lit a match, and touched it to a drape to see if it had been treated. Urban myth or not, it's best to play it safe. Most drapes that you buy from a pipe and drape vendor will already be fire retardant. If you want to make your own drapes, a safe bet is to purchase your cloth from a theatrical supply company, such as Rose Brand. 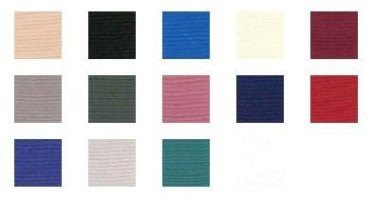 They supply fabrics that are used for stage draperies, so you can find a large variety. I bought fabric from Rose Brand to use for my booth table coverings. Upon request, a Flame Retardant Certificate will be issued to you for your records (I have one). I've heard that if you show documentation of your fabric's flame retardance, you can avoid a fire marshal's match test. Thankfully, I've never had to pull it out. The standard drape that you'll find at most trade shows is made from Banjo cloth (I'm not sure where the name came from - they're not made from recycled banjos). These drapes are the most economical and come in a range of colors. Banjo drapes have an open weave and are inherently flame retardant, which means that the flame resistant treatment will not wash out (they are machine washable). Premier drapes are another standard type of drape. They're a more opaque fabric than Banjo and have a smoother texture. Although they aren't inherently flame retardant, they have been treated with a flame retardant product. I own a set of Premier drapes and I can feel the treatment on the surface of the cloth. They also smell a little funky. You'll have to decide how many drapes you want to use for your booth. In my booth, each 10 ft. length of horizontal pipe holds three 60 in. wide drapery panels. As you can see, it creates a gathered effect. You can pull your drapes tighter for a cleaner, more contemporary look. The drapes have pockets at both the top and the bottom - you can thread your pipe through the top pocket and add weights to the bottom pocket to pull it taut. Next week I'll talk about pipe and drape accessories. If you have anything to add to the pipe and drape discussion, I’d love to hear about it! Share your experiences with the B.E.S.T. team by sending me an Email and I'll include them in a follow-up post. Be sure to include your name and a link to your Etsy shop. Many thanks to Exclusively Expo for granting permission for the use of their product photos in this post. If you're interested in anything specific, let me know.